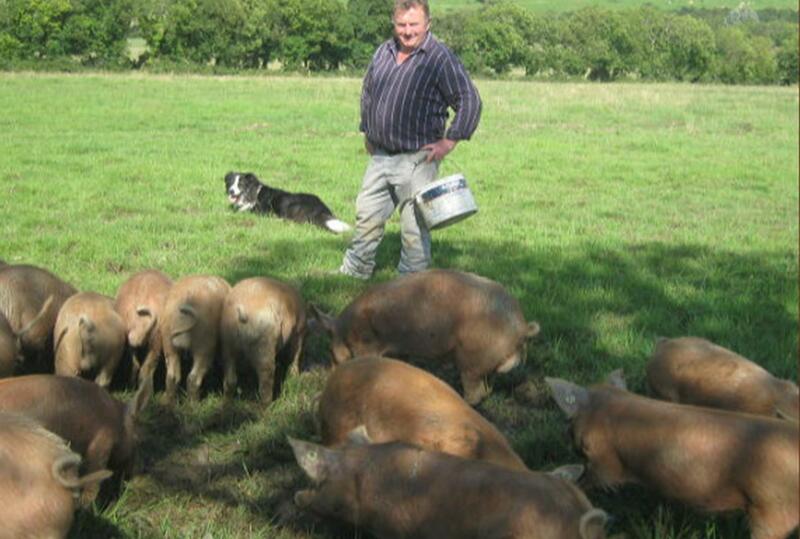 Peter’s background was not originally in farming and in years past he has worked as Leinster Sales manager for Western Brand Chickens and used to run the dog pound for Meath Council. Here, he tells us a little of his story. I grew up in Castleknock, Co Dublin and always remember the cattle lorries going by. When I was 4 years old I went on a farmhouse holiday with my family in Galway and that’s really where it all started. I have always been passionate about farming. During my time as a sales rep I had built up a good solid network of people who preferred to buy Irish and a few years ago I met a wholesaler who said that chefs could not get a regular supply of free range pork and I gave him some “Irish Grazer” pork from my own here to taste and he was blown away. He encouraged me to keep at the free range pigs as he would have lots of demand from top chefs. Have there been tough times? Taking the leap to full time farming was a risk and it was at this time that the contract with the council for the dog pound was vital, it was a good cheque coming in every month and allowed us to keep working on the farm. I started to build up a herd of “Irish Grazers”, keeping all my females for breeding. I could afford to do this as I had a fairly good income coming in. We kept in touch with our wholesaler friend and agreed a date we would be in a position to supply 2 to 4 pigs a week for a Michelin starred client of his. We kept building numbers and the date came and went and there was no sign of orders coming. I will never forget it was just coming to Christmas 2011 and we had tendered to renew our contract with the dog pound. We had been told we were doing a great job, so were quietly confident but when I opened a letter telling me we were unsuccessful in the tender just before Christmas I was gutted. Needless to say the first thing I thought of was all these lovely breeding stock that I had built up and were costing me a fortune in meal etc. I got very down in myself and went in to tell Susan my wife the bad news. It was time to make some serious decisions. I will never forget the sight of a huge lorry coming to my farm and loading up the best of pigs to go for slaughter. Even writing this still brings a tear to my eye. Christmas came and went and with it my 50th birthday on 22nd December. I was so low I told Susan I didn’t want to mark it, no surprises or anything. After Christmas I said to myself that we have to make a go of these pigs to try to generate a few bob. We had kept a minimum amount with this in mind and I rang a few people including Brid Carter of honest2goodness.ie Farmers Market in Glasnevin Dublin. Eventually we got a call from her saying Ed Hick (fourth generation pork butcher) was pulling out of her market and would we be interested? The answer was yes immediately, and we slowly built up a loyal customer base and happily are still there. Again I find myself working with like minded passionate people who really care where their food comes from. The main lesson I learnt from all this journey is it is great to be in full control of your own destiny. Not waiting on the phone to ring or waiting on a chef to say he can buy imported pork for cheaper. I don’t try to compete with the bottom, but I do believe in value for our customers. Monday, bring the pigs to Coogan’s in Trim for slaughter and then back home to feed pigs and deal with any sows farrowing etc. My days are filled with the usual farm chores, fencing etc (and most days you will find yourself chasing after little pigs that have wandered on to neighbours land!). I would get my pigs back from Coogan’s midweek and from then on its hectic as I am flat out in production and also still have to feed pigs etc. I try to deliver on Tuesdays and Saturdays but that can always change as if one of my customer needs an order urgently I try not to leave them short. The way of life I have chosen is not for the faint hearted, it throws up more problems than good days, that being said when you do get a customer praising the quality of your pork it keeps you going for a while again. Last October, having made it through to the finals of Blas na hEireann and going on to win Gold. It was the highlight of my whole experiences since I got involved in farming and selling direct to consumers. It is probably made sweeter as I didn’t come from a farming background. I think the key to success is firstly to pick a goal or dream. Then visualise you actually fulfilling this. Don’t lie down when you are knocked down, but more importantly remind yourself of what it was that you set out to do. Very well said Peter, Best of luck…. Brilliant. U forgot to say about the pigs laying the sausages.